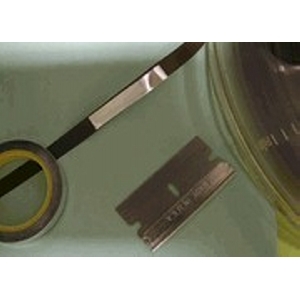 Sensing Foil Tabs For 8-Track Tape Repair - Tracer Technologies Inc. Need Any Cassette Repair Stuff? 20 1/4" tabs Self adhesive auto reverse foil is the best you can get for your tapes. It's truly conductive metallic foil similar in thickness to aluminum foil, and it's used to autoreverse open reel tapes as well as 8-track tapes and endless loop professional broadcast carts. Unlike some metallic-looking Mylar being passed off as reversing foil, this is the real thing. We suggest for 8-tracks, to ensure a good splice, use a splicing block like ours. When in doubt about the length needed to trigger your open reel deck, we suggest at least 1.25". This foil will NOT reverse non-reversing deck nor optical sensored decks for which a clear leader is needed. This foil uses a special adhesive for excellent bonding that you won't find on other foils. Why risk ruining a tape with a cheap imitation? Now you get a chance to be a shovel. With In The Lab, you can dig deeper into this product. You get to peer into the murky depths of the Tracer Labs and see what we do on our free time. This collection of articles is pulled from our newsletters and provides the extra details on our products that you can't find on a spec sheet. If you hunger for additional details on a product, open the door and come Into The Lab! Bake Me A Tape As Fast As You Can! There just might be hope for those sticky old tapes you have locked away. This cool new method could help you salvage your tapes long enough to archive them. DC SEVEN and tapes are old friends...see how they work together.